This year's Holiday Tree comes to us from Rockland County, New York courtesy of the Piperato family. John and Amy, along with their three small children, are thrilled to see the 53 foot Douglas Fir from their property grace the center stage at Citi Pond and The Holiday Shops. We'll celebrate the holidays with a festive ceremony tomorrow before the inaugural lighting of the tree. 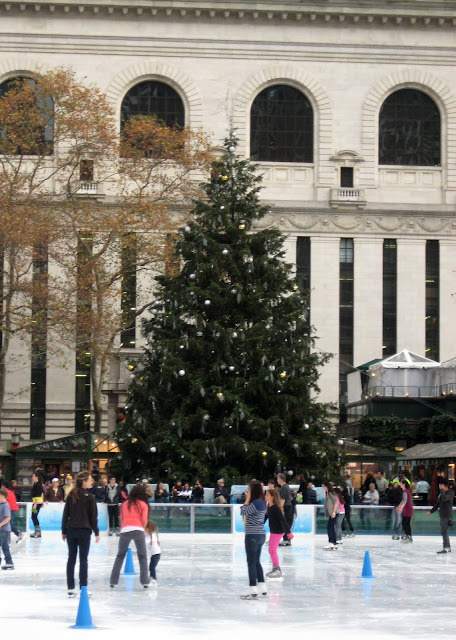 Attendees will enjoy special music, skating and Broadway performances before the main event, when the tree's tens of thousands of blue LED lights are flipped on. The free show includes performances by Sarah McLachlan, the casts of Million Dollar Quartet and Mamma Mia, British figure skater Steven Cousins, synchronized skating team The Haydenettes, and The Brooklyn Youth Chorus. The show runs from 7pm - 8:30pm, which means public skating will be closed from 4pm - 8pm to allow for rehearsals. Come early and grab a seat rinkside, or try to get a spot in the warmth of the skating pavilion or at Celsius, overlooking the Pond. Also take a look at the complete schedule for full performance information.